I have a billion things on my to-do list this week and I shouldn’t have removed the magazine from the plastic until Friday afternoon to avoid all possibility of distraction. But I got totally sucked into the December issue of Martha Stewart Living, specifically the short feature on paper clay ornaments on p. 98. I even rushed over to the House On The Hill website to order some cookie molds to make both cookies and ornaments with Abby and Amelia this holiday season. We had fun picking out the molds together and looking forward to finally making the Springerle cookies on p. 118 of the “Martha Stewart’s Cookies” book I received on Mother’s Day. It’s almost embarrassing how captivated by these paper clay ornaments. I even called House On The Hill last night to find out if you can use the molds to make cookies after using them to make ornaments. Connie, the company owner assured me that this is in fact safe to do this. Awesome. I’m not usually an impulse buyer, but I’ve been looking for cookie molds for a long time now and totally caved when I saw how lovely they look. Connie said she was flooded with orders, so I’m not the only one who fell in love with those ornaments. The cool part is the cookie molds are made in the USA, so Martha has done a very “good thing” for our economy. And if you’re reading, dear husband, I was just doing my part to help out. Yeah, that’s what I’m going to keep telling myself. : ) You can read more about my latest obsession here. 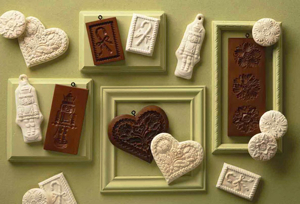 Have any of you used cookie molds for crafting before? I can’t wait to make some gingerbread cookies with them. I’m so looking forward to holiday baking. Just before heading out for a walk today with my 4 month old I checked my computer and told my husband “hooray, this is going to be a great Craftsanity”. I told him it was an interview with Amy Butler and asked if he knew who that was. He did! And he is not crafty but countless times has heard me mention her, has seen her fabrics that I buy, and has observed me pointing out other people wearing things made with her fabric. Anyway, it was a great interview-thanks to Jennifer and Amy! I’m crossing my fingers for goodies. Congrats, Kari! Please send me your snail mail address and I’ll send you your prize! It is the best time to make some plans for the long run and it’s time to be happy. I’ve learn this submit and if I may just I wish to counsel you few fascinating things or tips. Perhaps you can write subsequent articles relating to this article. I want to read even more things approximately it!